Have you ever washed your hair expecting good results but your hair didn't turn out as you expected or even hoped? That's happened to me several times. I have hair that tends to be on the dry side so it's important that I use a lot of moisturizing products - shampoo, deep conditioner, and leave-in conditioner - but sometimes that isn't enough. Sometimes my hair needs a little bit more to moisturize it and keep it moisturized. That's when I add another step to my wash day. That step is the pre-poo. Pre-pooing is simply a hair treatment that happens before you wash or shampoo your hair. Hence the name pre-poo. When you pre-poo you can use a conditioner, oil mixture, products from your kitchen or a combination of all the above. I started pre-pooing my hair after reading posts from several other bloggers who started doing and saw good results. I like pre-pooing because my hair doesn’t feel extremely dry after I shampoo, especially when I use a sulfate shampoo. Also, my hair tends to hold moisture better between shampoos when I pre-poo. I try to pre-poo once a week and most of the time I use some type of conditioner. Other times I want to get a little creative and mix some things up in my kitchen. When I do that I use one of two favorite DIY mixes. 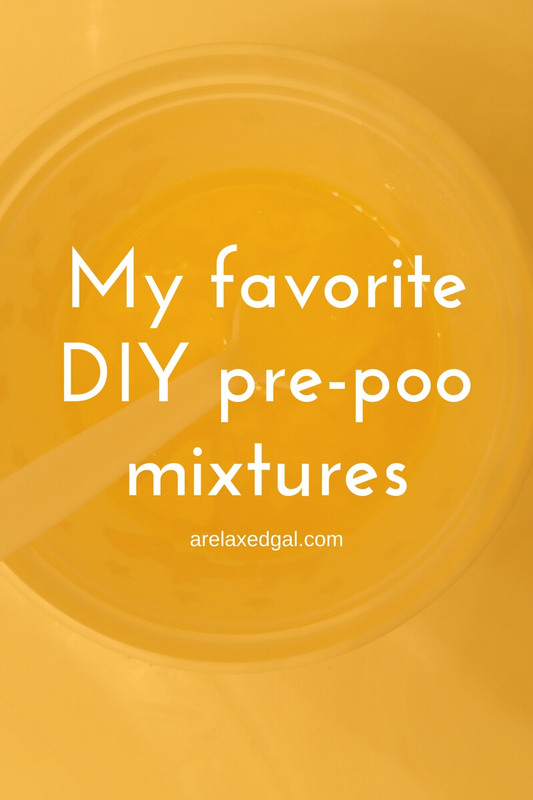 Because this pre-poo mixture only uses oils, I’ll sometimes heat it up before applying so it doubles as a great hot oil treatment. I like to use this pre-poo when the weather gets cooler because honey is a humectant and draws moisture from the air helping to keep my hair moisturized. Because honey is sticky and can be messy I like to use a conditioner as a base and help with mixing the honey with any other ingredients I add. While I sometimes add multiple ingredients, this particular recipe is the more common one I use. What are your favorite pre-poo mixes?